Have you checked your tyres and wheels? Caravan wheels may look similar to car ones, but they are usually specially made for caravan use. On a single axle caravan, each wheel has to support at least half the weight of the caravan, which is often more than one quarter of the weight of a typical car. It is important, therefore, to consider carefully any change in wheel specification for your caravan. As a general rule, it is not a good idea to use car wheels on a caravan, unless you can establish (usually from the wheel manufacturer or supplier) that they are appropriate. Tyres, however, are not specially made for caravan use. Caravans use either tyres made for cars, or ones designed for use on small vans. While there are tyres designed specifically for use on trailers, these are only available in specifications which suit models like small camping trailers, or one or two specialist types of larger commercial trailer. All caravans use car or light van tyres. If you have bought a new caravan, you should be able to assume that the specifications of the wheels and tyres are appropriate. The correct inflation pressure should be indicated in the caravan handbook, and is sometimes marked on the wheel arch for convenience too. Many new caravans come equipped with a spare wheel, but this is not a legal requirement. If you get one as standard, it should be the same or equivalent specification of wheel and tyre as the others. If you need to buy a spare separately, make sure both the wheel and tyre are suitable, and compatible with the original ones. We strongly advise carrying a spare wheel and tyre. Caravan manufacturers tend to buy tyres in bulk, and it may take them some time to use up their stock. This is not necessarily a problem if the tyres have been stored in suitable conditions of temperature, humidity and light. Any time the caravan has been stored awaiting sale or delivery should be counted as time during which the tyres will have started to age. You are unlikely to know the history of a second-hand caravan - at least in terms of issues such as how much care the previous owner took of the tyres. Assume the worst, and look for signs of abuse and wear and tear. We recommend to always check the tyres are set to their optimum pressure, including the spare tyre. Some people prefer to take no chances and factor in the cost of replacing all the tyres on a second-hand purchase as a matter of course. The most important thing to check is the age of the tyres. Even if visually good, and if the caravan has seen careful use over modest mileage, you may still need to replace the tyres due to their age. Particularly on older caravans, the tyre specification may need to be upgraded, either to allow use overseas, or simply because the original type of tyre is no longer available. Caravans do a fairly low annual mileage – on average around 2,000 miles a year, so it would take many years of use to wear out the tread. However, two or three factors can make them deteriorate in a different way, even with careful use. All tyres age and deteriorate due to exposure to sunlight and atmosphere, even if not used. Caravan tyres can suffer fatigue due to the repetitive small impacts they suffer in everyday use. Being stored for long periods of the year without use can put undue strain on one particular part of the tyre. It should go without saying that tyres which are damaged or worn to the legal minimum tread depth must be replaced immediately. Caravan tyres need regular replacement, irrespective of their visual appearance. We recommend that you replace your caravan tyres when they reach five years old and should never be used when more than seven years old. If your tyres need a high inflation pressure (50psi or more), you should check regularly for signs of deterioration from three years old and should not be used when they reach five years. Remember – the tyres age starts from when it was made, not from when it was fitted. Check the tread wear regularly – the legal minimum is 1.6mm across the central three quarters of the tread breadth around the entire circumference of the tyre. Major tread wear during the normal life of the tyre may indicate a more serious problem, such as incorrect loading, wrong inflation pressure or even poor wheel alignment. Tyres which are operated in an overloaded condition may also show uneven wear across the width of the tread. Even a small variation in wear across the width (as little as 1mm according to tyre industry sources) is a possible indication of overloading. Replace any tyre that has blistered, ruptured or been cut penetrated by an object. Developing problems can sometimes be detected most easily by running a gloved hand over the surface to the tyre, feeling for any raised or uneven areas. 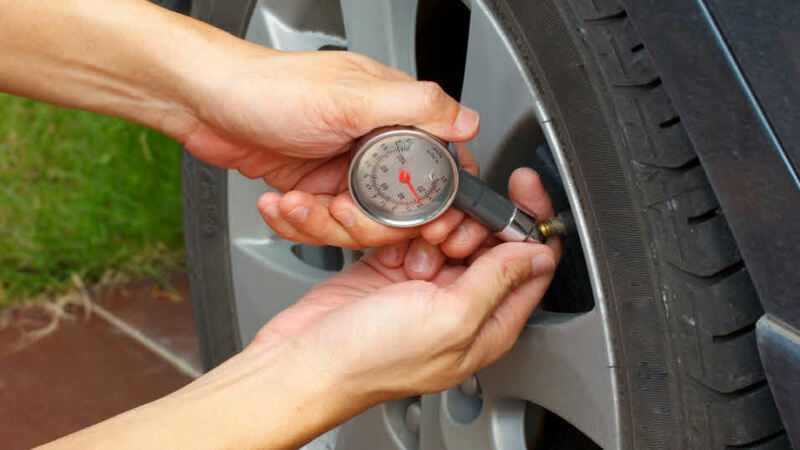 Establish a routine to check tyre condition each time you check pressures. Do not forget the side of the tyre facing away from you, although to check this surface thoroughly, you will periodically need to remove the wheels from the vehicle. Check the condition of your tyre valves. Make sure the valve stem is undamaged, and is correctly aligned with the valve aperture in the wheel, and not distorted when the wheel trim (if fitted) is installed. Be sure that all valves have suitable valve caps. Valve caps that have sealing washers offer better protection against dirt and dust. Check the valve is not leaking especially after measuring the inflation pressure. Make sure the valve has closed again correctly - if in doubt, fit a new valve. Check the rim is clean and free from rust (if it is steel), burrs, cracks and distortions. Check that the stud holes are not damaged or elongated, and are clean before fitting the studs. Follow a correct procedure for refitting wheels after removal. Steel wheels can be painted to freshen their appearance after a few years’ use, but be careful not to obscure any damage or non-cosmetic deterioration under a layer of paint. Do not get paint on the tyre itself, on the mating surface between the wheel and the hub, nor on the stud holes. Alloy wheels can be refurbished by polishing and lacquering, but this is a job best left to professional refinishers. Balancing caravan tyres has some advantages; improved tyre durability and wheel bearing wear. Tyre imbalance becomes increasingly significant from around 55mph upwards, so balancing is particularly worthwhile if significant motorway towing is likely. A well filler (eg Tyron Band), can help retain a tubeless tyre on the rim after a puncture, but cannot be used with inner tubes. Keep the multi-lingual instructions and Allen key in case tyres need to be changed abroad. It is important that Tyron equipped wheels are fitted with safety wheel identification markers (15mm diameter red sticker) on the wheel next to the valve. This is becoming recognised by fitters and warns them not to force the tyre off the rim before realising the Tyron band if fitted. Valves vary in length. Make sure the valve used is correct for the wheel and any trim fitted. Always fit new tubeless valves when new tubeless tyres are fitted. Remoulds/retreads marked with the relevant European Regulation (ECE Reg 108 or 109) are generally suitable for caravan use. The vast majority of tyres in use today do not require inner tubes, and many wheels and tyres cannot be used with them. Fitters sometimes advise fitting tubes to caravan tyres when they are neither necessary nor appropriate. Take specialist advice before any such use. We do not recommend the use of pre-puncture sealants, mainly due to a lack of credible, independent, widely applicable test standards for them. The BTMA specifically recommends against such products, and the existing British Standard for tyre repair states that sealants cannot be considered to be a permanent repair under the terms of that standard. After a puncture, have the opposite side (non-punctured) tyre removed from its wheel and checked inside and out for signs of damage. Failure to take this precaution may result in an increased risk of a second tyre deflation within as little as 100-200 miles. For this same reason, we strongly advise to get a punctured tyre repaired or replaced as soon as possible. An incorrectly fitted or adjusted electric caravan mover which operates by means of rollers pressing against the caravan tyres could cause damage to the tyres. If the rollers press with too much force, the tyre could be distorted sufficiently for its structure to be harmed, and movers should never be left with the rollers engaged against the tyres when not in use. Similarly, too little pressure could cause the roller to spin against the tyre, causing abrasion to the tyre surface. Rollers may also spin if the mover is used to try to force the caravan against or over an unduly large obstacle. Are caravans legally required to have an MOT or a service? Caravans and other light trailers are exempt from MOT-type testing. However to be road worthy, there are legal safety requirements that must be met. Take a look at our news article for more information. Do you have a list of approved caravan and motorhome repairers? Yes, we have a list of workshops which have been independently inspected and approved to the requirements of the Approved Caravan Workshop Scheme.